Transport is the highest energy consumer of all sectors, and its consumption has been increasing in the last number of years. In 2008, the share of transport in total final energy consumption amounted to almost 40 %; in comparison with 1992 it increased by 138 %. Inside the transport sector, road transport is by 97 % the largest consumer. Statistical Office of the Republic of Slovenia, Jožef Stefan Institute. Energy consumption significantly influences the environment, mostly through climate change. The increase in transport energy consumption has lately nullified the reduction in other sectors, which is also reflected in greenhouse gas emissions. Measures that influence the efficiency of energy consumption of individual vehicles have had a certain impact; however, the latter was nullified with an increase in the number of vehicles, driven kilometres, etc. Transport is the only sector where fossil fuels represent by far the largest share. Therefore, a reduction in the final energy consumption is significant from the point of view of providing reliability of energy supply, competitiveness of the economy and reduction of the impact on the environment by reducing emissions of pollutants of ambient air and greenhouse gases. The course of the transport policy toward sustainable energy use is already indicated in the Resolution on Transport Policy, while specific measures are also included in the Operational Programme for Limiting Greenhouse Gas Emissions by 2012. The programme includes measures that increase the efficiency of energy consumption – the reduction of emissions by personal motor vehicles, as well as measures that change the transport structure – the promotion of public transport, sustainable freight transport (transfer of freight transport from roads to railways) and measures for an increase in the consumption of renewable energy sources in transport – the promotion of the consumption of biofuels. Transport measures are also included in the National Efficiency Energy Action Plan for the Period 2008-2016. The main problem in Slovenia is the implementation of measures in the transport sector. Transport energy consumption in 2008 amounted to 2.148 ktoe. In comparison with the previous year, it increased by 17 %; in comparison with 2000 and 1992 by 63 % and 143 % respectively. The most energy was consumed in road transport, which represented in 2008 app. 94 % of consumption. International air transport contributed 1.6 %, rail transport 1.3 %, domestic air transport 0.05 %, and other sectors (consumption in agriculture and forestry) 3.4 %. In 2008, diesel fuels were mostly consumed (64.7 %), followed by motor gasoline by 31.6 %. Other fuels used were kerosene by 1.6 %, biodiesel by 1.0 %, electric power by 0.8 %, liquid petroleum gas by 0.1 %, biomethanol by 0.1 % and air gasoline by 0.05 %. In the period 1992-2008, the consumption of energy in international air transport increased the most of all transport modes, followed by road transport. 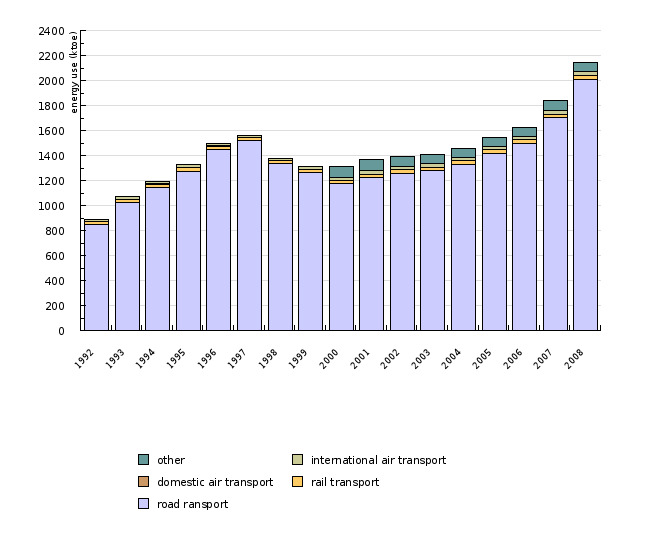 In the period 2000-2008 the situation was reversed, since the consumption in road transport increased the most, followed by international air transport. Energy consumption in rail transport was higher by 2 % in 2008 in comparison with 1992, and in comparison with 2000 it was higher by 19 %. Among fuels, the consumption of diesel increased the most, which can, in recent years, primarily be ascribed also to transit transport (MESP, 2009). The increase is especially significant in the last two years – after the entry of Romania and Bulgaria into the EU. In total final energy consumption at the state level, the transport share in 2008 amounted to 39.5 %, which is the largest share in the entire period. Since 2005, it has increased by almost 10 percentage points. Transport energy consumption is closely connected to its volume, which is connected with economic growth. The reduction of the negative influences of the use of fossil fuels in transport belongs to the objectives of the Kyoto Protocol. They can be achieved by a reduction in transport demand, increase in energy efficiency of transport modes or increase in the share of alternative or more sustainable energy sources (primarily biofuels). Increased transport demand and an increasing share of road and air transport in combination with heavier and stronger cars and trucks have so far nullified the technological improvements in energy efficiency of engines, which were smaller than planned. Therefore, in December 2008 the EU adopted the Regulation (EC) of the European Parliament and of the Council setting emission performance standards for new passenger cars as part of the Community's integrated approach to reduce CO2 emissions from light-duty vehicles. The regulation stipulates that average emissions of new vehicles after 2015 will not be allowed to exceed 130 g CO2/km, while an additional reduction in emissions by 10 g CO2/km will be achieved by the improvement of tires and consumption of biofuels. However, it is still questionable when these technological improvements shall defy the growth movements in road transport (EEA, 2006). In Slovenia, the implementation of measures that would influence the behaviour change in transport is extremely low. The number of passenger kilometres in public transport is still decreasing, rail transport is limited by its infrastructure, in the past only investments in road infrastructure were carried out, etc. In the EU-27, the share of road transport in transport energy consumption in 2007 amounted to 82 %, air transport 14 %, rail transport 2 %, and inland maritime transport 1 %. In terms of total final energy consumption, transport represented 32.6 %. Objectives summarised by: Resolution on the National Energy Programme (ReNEP), OG RS, no. 57/2004, Resolution on National Environmental Action Plan 2005–2012 (ReNPVO), OG RS, no. 2/06 and Regulation on Energy Savings ensured to Final Customers, OG RS, no. 114/2009, implementing the Directive 2006/32/EC on Energy End-use Efficiency and Energy Services and Operational Programme of Environmental and Transport Infrastructure for the Period 2007–2013. 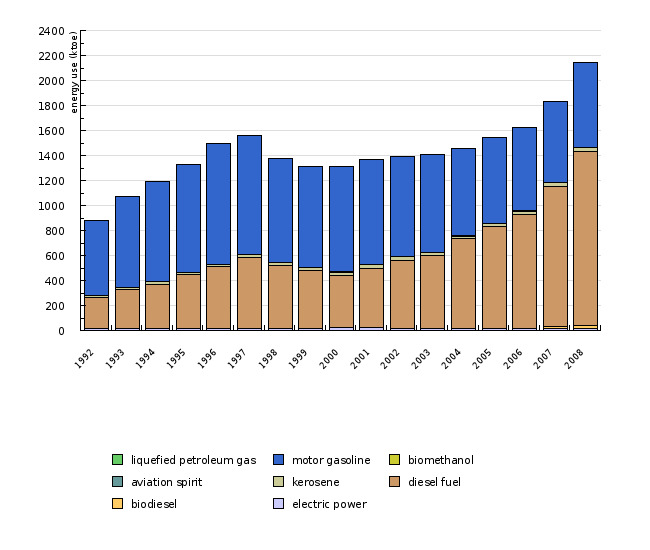 Source database or source: The data was calculated on the basis of data on fuel consumption in mass units, which was communicated to EUROSTAT by SORS in form of an annual questionnaire, and the data on calorific values for individual fuels, which was obtained from the web application SI-STAT of the Statistical Office (liquid fuels). The data for the EU-27 was obtained from the EUROSTAT webpage under the heading »Environment and Energy«. Data administrator: Statistical Office of the Republic of Slovenia or EUROSTAT. Date of acquisition for this indicator: 4 December 2009. Methodology and frequency of data collection for the indicator: The data is prepared on an annual basis. The data for the previous years is available at the end of the current year. Data processing methodology: Average annual growth of final energy consumption is calculated as [(last year/base year)(1 /number of years) –1] x 100. - Advantages and disadvantages (at data level): The source of basic information is one institution (SORS, EUROSTAT) for the entire time series. This enables a quality analysis of events in the considered period. Reliability of the indicator (archive data): The reliability of data is assessed with the amount of statistical differences appearing in the energy balance due to the use of various calorific values. EUROSTAT uses the criterion that the energy balance was solid if the statistical difference is less than 5 % of energy consumption at the level of the entire state. The statistical difference for the used data amounts at the beginning of the period to 2.5 %, until 1999 it amounted to around 1 %, while after this year it was less than one percent. Unreliability is based on the assessment of the use of fuels in agriculture. - EEA, 2006. TERM 2006 01 – Transport final energy consumption by mode. Indicator Fact Sheet. European Environment Agency. - EU, 2009. Regulation (EC) no. 443/2009 of the European Parliament and of the Council of 23 April 2009 setting emission performance standards for new passenger cars as part of the Community's integrated approach to reduce CO2 emissions from light-duty vehicles. - MG, 2004. Resolution on the National Energy Programme. OG RS, no. 57/2004. - MESP, 2009. Operational Programme for Limiting Greenhouse Gas Emissions until 2012.